C-COM is a provider of auto-deploy satellite antennas. OTTAWA, February, 2016: C-COM Satellite Systems Inc., a leading global provider of mobile auto-deploying satellite antenna systems, has announced that it has received approval to operate its Ka-band iNetVu® mobile antenna products on the Galaxy Broadband network. 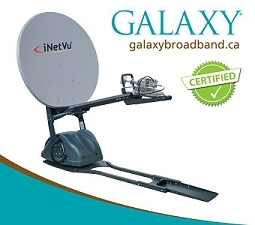 Galaxy Broadband is a leader in enterprise grade VSAT services to remote areas across Canada and the United States. The iNetVu® Ka-98H system was successfully deployed and tested on the Galaxy F2 Ka-band network in January, expanding C-COM’s footprint for service in the most Northern parts of Canada. This exciting development will provide mobile customers in Canada’s north the capability to deploy the C-COM manufactured iNetVu® Auto-Deployable VSAT solution over Galaxy’s extensive Ka-band network that covers BC, Northern Alberta, Northern Saskatchewan, Northwest Territories, Nunavut and Eastern Alaska. With Galaxy’s service offering, mobile clients in the Canadian Arctic can now have access to a network that can deliver 5 Mbps down and 2 Mbps up, rivaling speeds available in more southern locations of the country.